Elderly but vibrantly present in a peaceful way. 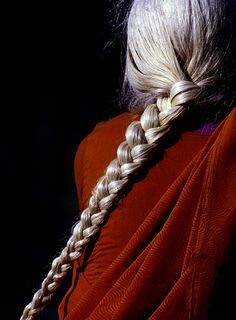 Tall, slender, silvery white hair long and worn back in a braid that trailed down her back, much like my own darker one. She had a delicate gentility about her. Two things made one do a double take when seeing her. One was the red Bindi mark in the middle of her forehead, and the other was her fully orange outfit. The shades of orange did not match per se but somehow it all blended well, and was surprisingly not shocking to the eye… just unexpected, as much about her turned out to be. When she spoke you leaned in as if she was whispering, but really it was the softness of her presence, of the energy she reached out with, that drew one in, as if into an intimate conversation. As it turns out that is exactly the kind of conversation we shared. “Do you see the 2 oz cups in clear? All I see is black and I’d rather the clear. I need the 2 oz size for certain because my labels will fit on these perfectly.” The woman next to me seemed to be searching for the same disposable condiment cups as I was, in the paper products aisle. “Hmm, no, I don’t. Sorry – I’ve been looking for them as well”, I replied. After a few more exchanges over product options for each of our needs, my new shopping friend excused herself to go ask a store employee if maybe there were some in the back. When he went to check on that for us is when things got interesting… and personal. “You lost someone in the desert didn’t you?” she asked me. 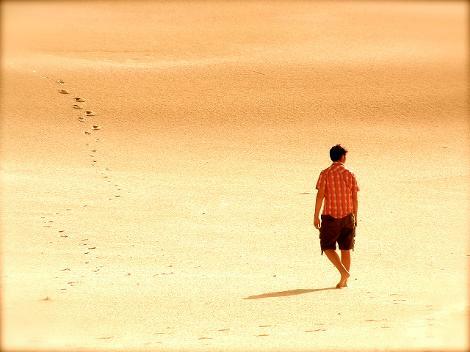 “You lost someone or… “, she trailed off for a brief moment as she tried to pinpoint the precise phrase she was looking for. “They were lost to you” she corrected herself with a satisfied sound in her voice. “I’m certain I don’t know what you mean”, was my quiet but agitated sounding response. “Yes you do Dear. Something happened – was it an accident? No, it doesn’t seem to have been…” she was practically dialoguing with herself now. Crazy old lady in the market? Anyone else would have thought so, but I knew better. I knew exactly who she was referring to, exactly where, and exactly what had happened. “Oh I’m sorry Dear. This happens more on sacral chakra days… you know” she said as she waved her hand over her orange themed outfit. Indeed I did understand. Different days she was aligned with different chakras and the energy flow to, from, and through it and ‘orange day’ seemed to be a doozy for receiving intuitive messages. Lucky me. “This person who got lost Dear, they are already back, yes?” she asked me. There was no sense denying I knew what she was talking about. We both knew I did. “Yes. Physically anyway”, I confirmed. It was one thing to have events ‘seen’ by a stranger. I’m used to that. Hell, I DO that – see things about strangers I mean. To have my psyche analyzed as well, was another matter. Problem was, she was right. The store clerk returned and let us know that regrettably they did not have the desired items in stock. I thanked him for checking and turned back to my new ‘friend’, but she was gone. I asked the clerk if he happened to see which way the lady had gone. “What lady?” he asked, confused. She had spoken to him, he had replied to us both, how could he not know who I was referring to. No. No! I had not imagined her. I set off through the store at a rapid pace, intent on tracking done the woman in orange. Resigned, I got on line to pay for my selected items. “The black really will work nicely”, said a familiar voice behind me. I spun around to face my orange clad elusive friend. She was holding up the little black container, pleased with her revised plans. “I thought you had left” I said. “What do you mean Dear?” she asked a tad too innocently. I paid the cashier and turned to say good bye. This time she was still there. “Bye Dear. Have a wonderful day” she said with a smile. I replied in kind and went out to the parking lot. As I loaded the shopping bags into my Jeep, I thought about what she said, what she knew… about what happened, and most of all how I have been handling it. As I shut the lift gate, a paper flew up off the ground and landed on my bumper. ‘Desert Time’ shouted the vacation flier. Yes shouted. The paper flies upwind and takes a sharp left onto my bumper? Right now? After THAT chat? Yes that does constitute as shouting. I shook my head. Welcome to a weird day in my world. Cosmic signs everywhere. Ok fine… I can handle this. “Baby come BACK here. Back here NOW” someone in the parking lot was yelling to someone out of my range of vision. Ok Got it. What was lost in the desert is back. I need to trust that. Not worry that it will get lost again, permanently. Got it. Logically anyway. Keys in hand, I turned to go to the driver’s side of my Jeep, and stopped short, as I came face to face with The Lady in Orange. “Of course, I’m fine” I replied with a smile. She squeezed my hand and was on her way. I wonder how often I’ll be seeing orange. For now….it’s time to welcome someone back. My heart says so.